So… I am still trying to play catch up on here so this post is about a baseball game I went to back in April. Baseball is very popular in Korea, but Busan is especially famous for baseball and it ‘s not because they have a good team (they have lost 2 of the 3 games I’ve been to). 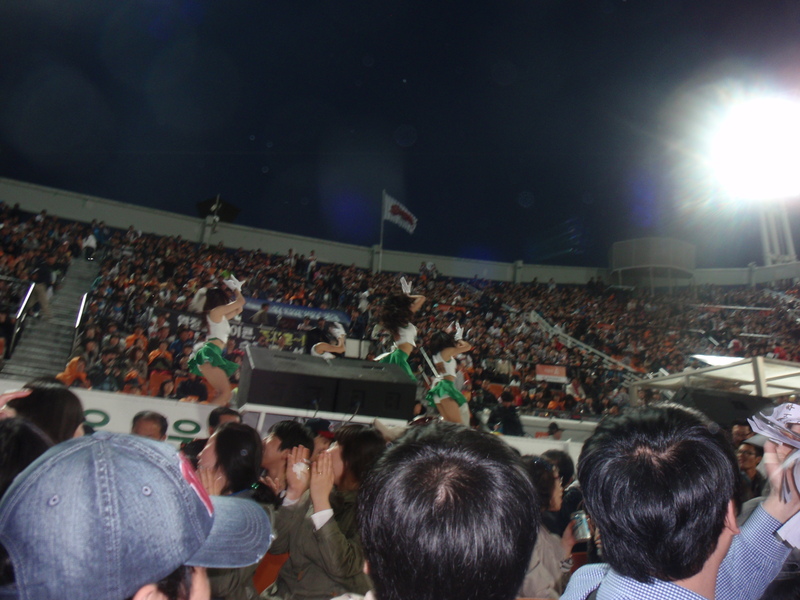 The Busan Lotte Giants are famous for their cheerleaders! The cheerleaders even change outfits throughout the game! 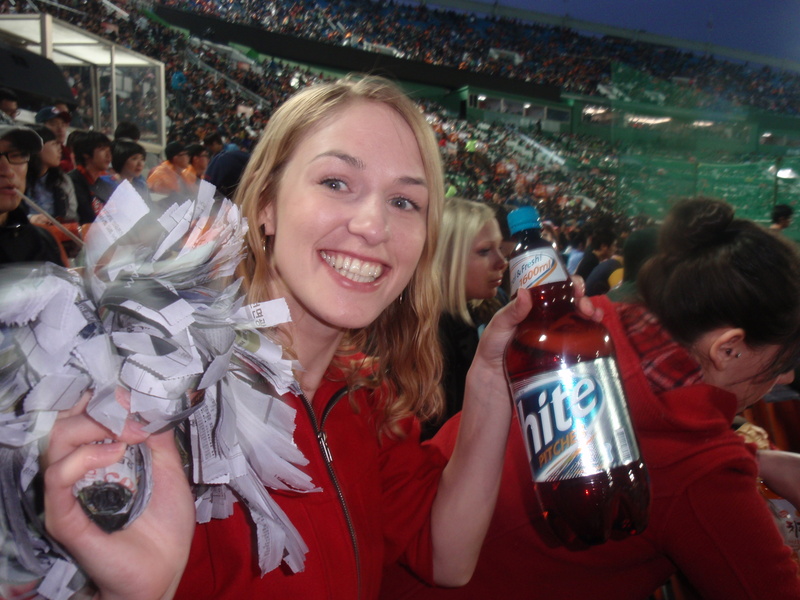 The great thing about baseball games in Korea is that you can bring in your own food and drinks. Yep… even beer! And people don’t hold back. I have seen small groups of people carry in cases of bottled water and beer. I mean, seriously… how much water can you really drink in a 3 hour span. Another thing that’s quite popular are these newspaper pom-poms. 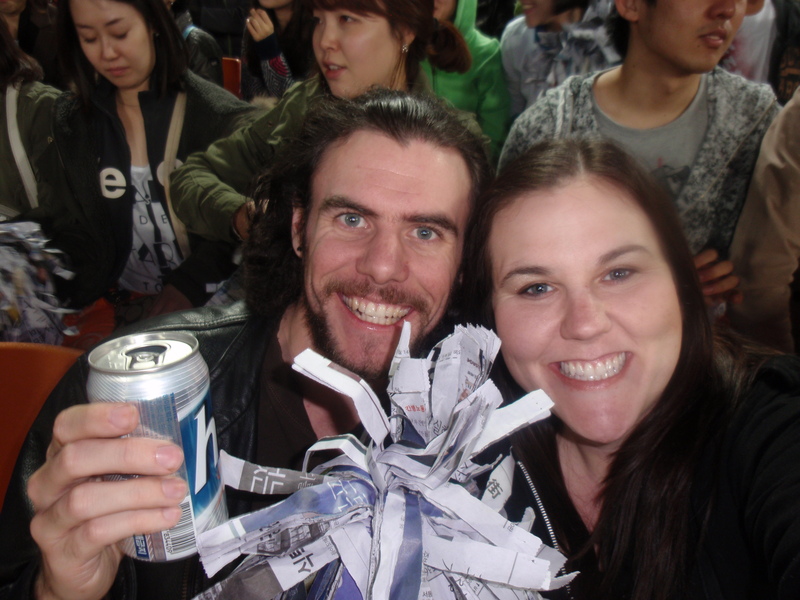 People tear up newspaper and make pom-poms out of them. 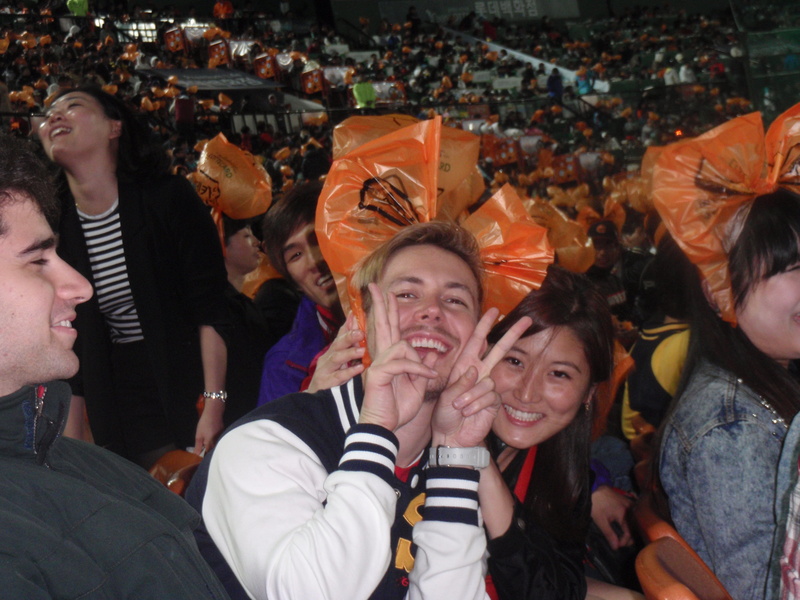 This one was generously given to us by a friendly Korean at the game. 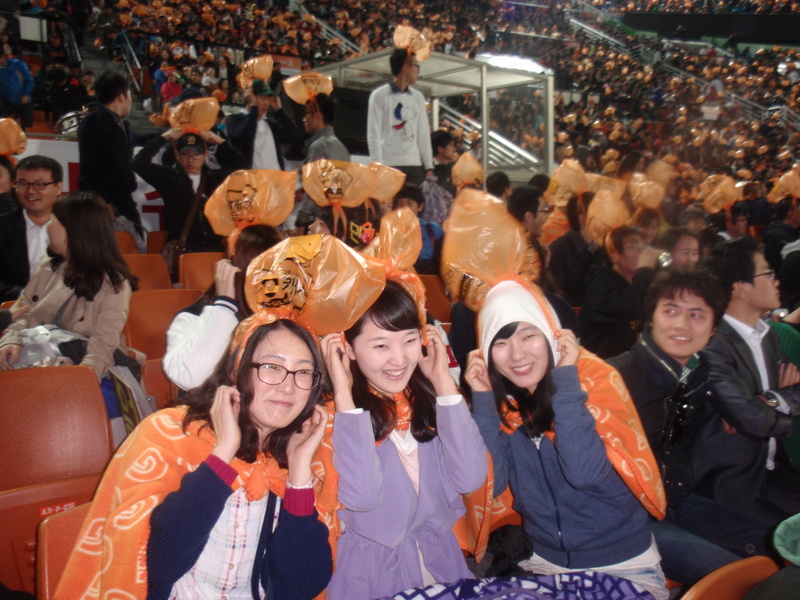 Here are the gals at the game. 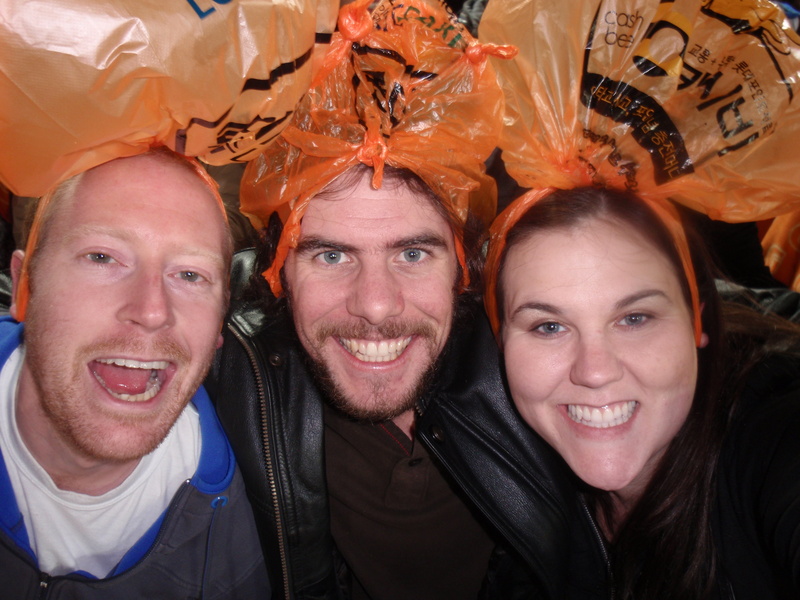 You might be wondering why everyone’s putting orange sacks on their heads… you are, right? 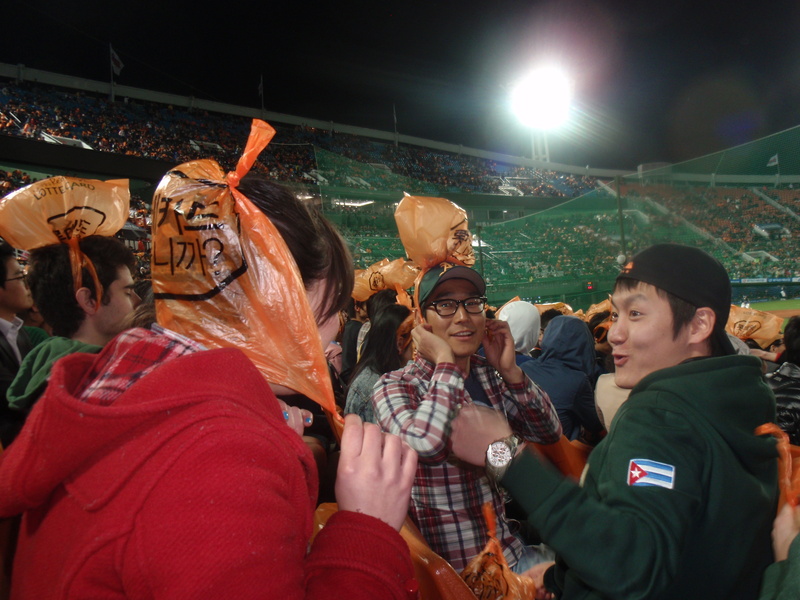 Towards the end of the game, they pass out these sacks so everyone can put their trash in them to make it easier for the clean up crews after the game. Somehow people decided to make hats out of them and wear them until they were ready to dispose of their waste. 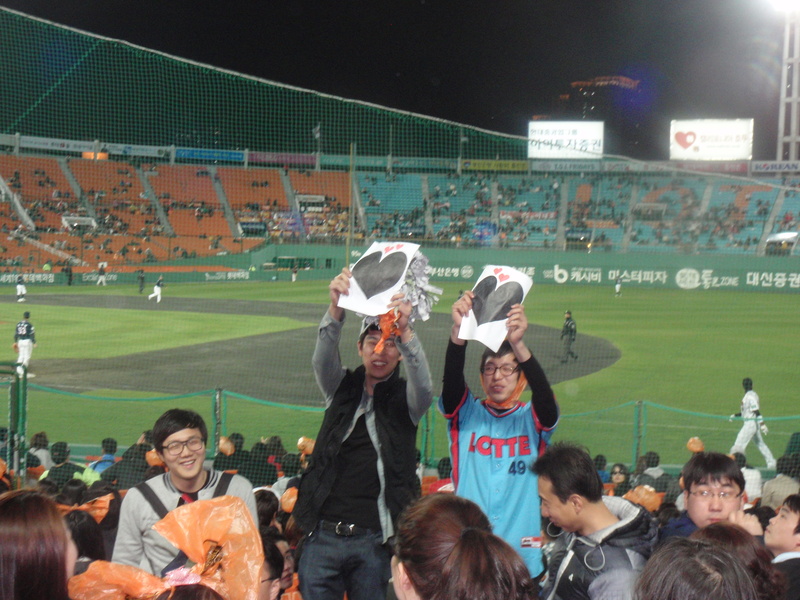 It caught on and now it’s just a thing you do at Lotte Giants games. You can also make cute bows out of the bags. That’s a bit more than I am capable of, but Chris and Stella seemed to figure it out. 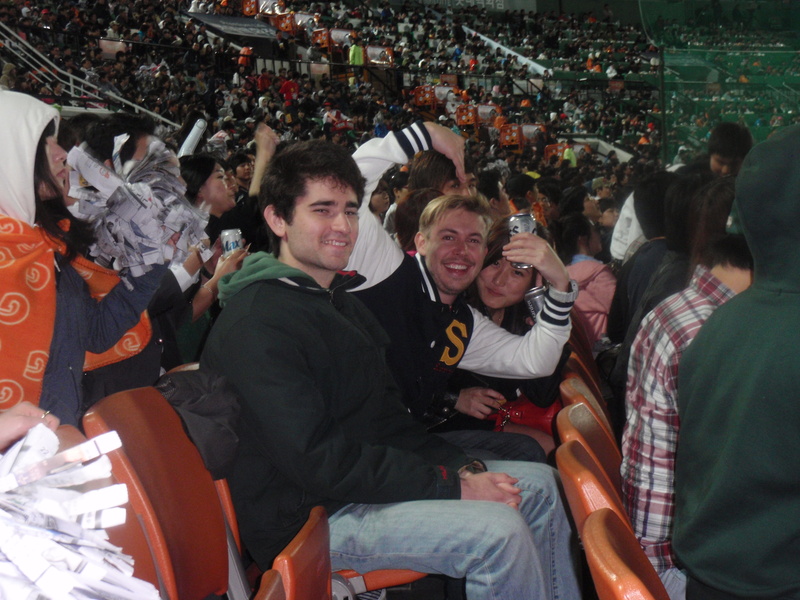 It was a great time… baseball in Busan is so much fun! Back home, teams are named after the city they are from and the stadiums are usually sponsored by and therefore named after companies. Here, it’s the opposite. 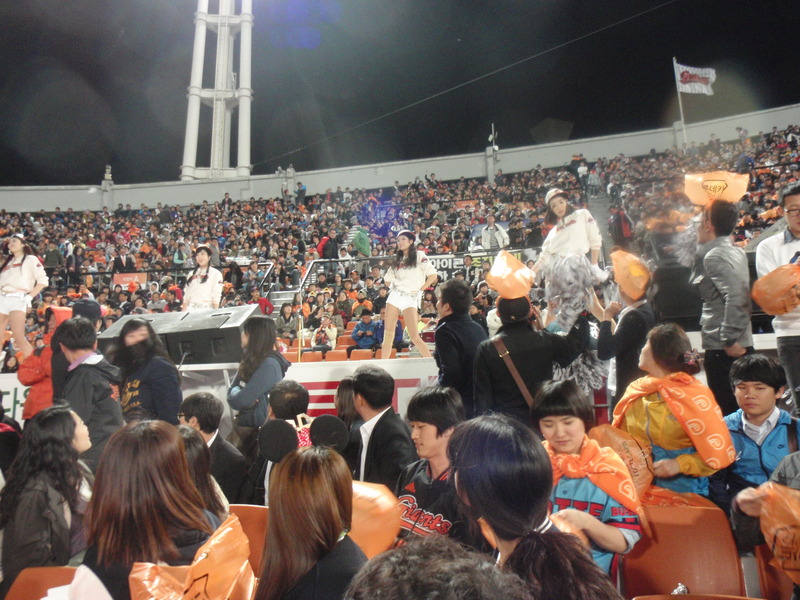 The Lotte Giants play at Busan Stadium. Lotte is a HUGE company here. It is the name of the major department store chain and you see that brand name every day. Some other baseball teams in Korea are the Samsung Lions (from Daegu), Kia Tigers (from Gwangju) and LG Twins (from Seoul). 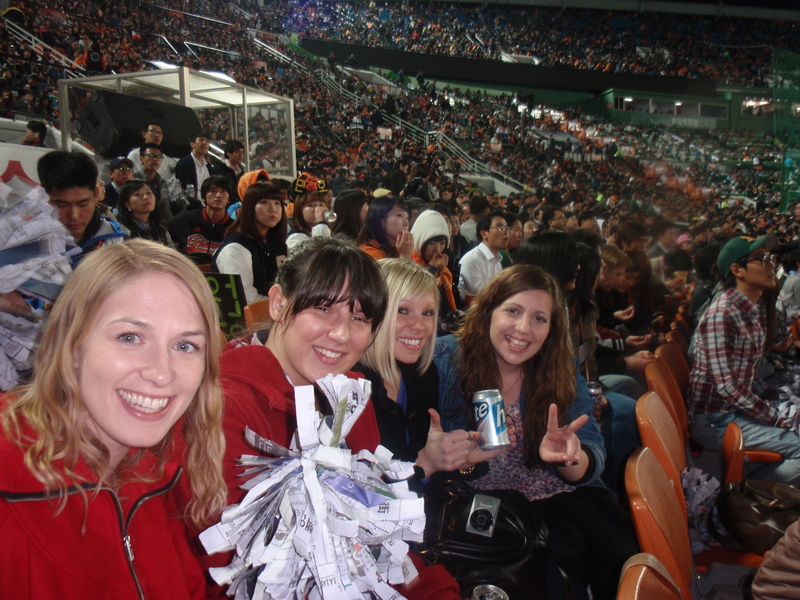 This entry was posted in Uncategorized and tagged baseball, Busan, Busan Stadium, cheerleaders, EPIK, ESL, hats, Korea, Lotte, Lotte Giants, plastic bags by Meagan & Dave | HappilyEverExpat.com. Bookmark the permalink. Ah, I love it. They got the idea from the cheeseheads I’ll bet! Looks like so much fun, Meagan.